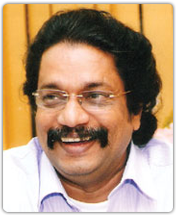 Dr. C. Satish is the Sr.Principal & Director of Paavai Group of Schools. He has 30 years of experience in educational field. He was with DAV Gopalapuram for the past 28 years as teacher and principal for 18 years before joining Paavai Group. His professional and administrative experience has benefitted the teachers, parents and students through his interviews in national and state television channels as well as through leading newspapers. He was awarded Ph.D. in commerce by the University of Madras for his research on HRD practices. D.A.V. Gopalapuram under his leadership was rated 5 times as one of the best schools in the country by leading magazines such as Outlook, Rediff.com, Education World Magazine and ‘C-fore Survey’. He was rated the best in leadership in the entire country among school principals in the year 2009 by C-fore survey and awarded a certificate and medal in recognition of his services. He holds a post graduate diploma in Yoga Studies recognized by Government of Tamil Nadu Health Ministry. He was the recipient of President Award for best teacher in 2006. He received the award from the Honorable President of India Smt. Prathiba Patil. He was also appointed by CBSE to inspect schools for affiliation. He played the role of mentor for CBSE schools for CCE implementation up to class X. He is also the recipient of Vocational Excellence Award in 2007 from His Excellency Shri.Surijit Singh Barnala, Governor of Tamil Nadu. He has also received the Best Principal Award from many organizations such as Lions Club, Rotary Club and other professional organizations. He has also authored many books on personality development for students. He is also the Director of MITRA Leadership Academy. Thousands of participants, students and professionals have been benefitted from his training programme on leadership skills. Under his leadership, D.A.V.Schools, Gopalapuram produced 100% results in Class X & XII Board Exams with most of the students securing 90% and above marks in various subjects. On an average, 18-20 students have joined IIT and many students have joined National Institute of Technology (NIT) and reputed Medical Colleges. Similarly in Paavai best results are achieved from the inception. In 2018-2019, 122/155 students cleared NEET and 22 students got MBBS admissions through government Quota. Good numbers of students from commerce have got into reputed colleges like Loyola college- Chennai, Christ College-Bangalore, PSG College-Coimbatore and so on. Top score in NEET of 617 got a placing of state 10th and in AIIMS All India ranking of 44th in OBC category. In 2018-2019 JEE IIT (MAIN) was a landmark with 3 students securing a percentile of 99% and 25 with a percentile of 90% and above. In KVPY exams 5 students cleared stage 1 and 2. In the UGCE exam for designing 2019, an All India Ranking of 217 in open Category and 34 in OBC Category and many clearing NTSE in the past few years were milestone achievements.